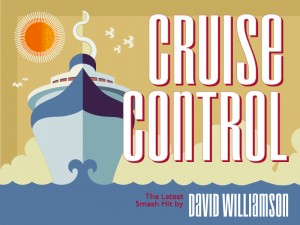 Rocking you into an acceptance of its premise and characters, Cruise Control is David Williamson at his most relaxed and genial. We’re aboard the Queen Mary II as it ploughs its way to New York, on a route that takes its passengers to the spot where the Titanic met its fate. Happily, the only ice encountered on this voyage is being used to chill the Dom Perignon. In quick succession we meet three unhappy couples who have failed to tick the appropriate boxes in their paperwork and find themselves locked into designated seating at dinner.